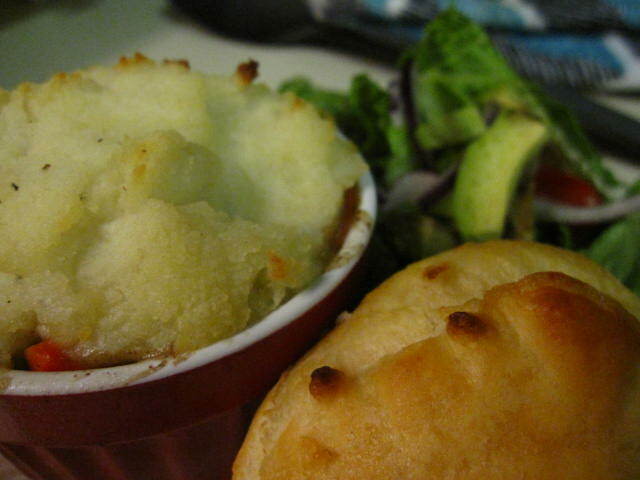 Shepherd’s Pie with biscuits and salad. If you’re looking for a quick and inexpensive dinner, this recipe should do the trick. Heat 1T olive oil in pan over medium heat. Saute onions and carrot until soft. Brown the beef. Add peas, thyme, oregano and parsley. Add beef broth and simmer. Make a roux, mixing 1T flour and 1T olive oil. Add roux to thicken. Salt and pepper to taste and set aside. In a separate pot, boil potatoes. Strain and add desired milk, butter, salt and pepper to make mashed potatoes. Place the pie filling in an oven safe pan (I used individual ramekins) and top with mashed potatoes. Heat in 400 degree oven for 10-15 minutes to give the potatoes a golden crust. I served with a 5 pack of Pillsbury rolls and a salad on the side.